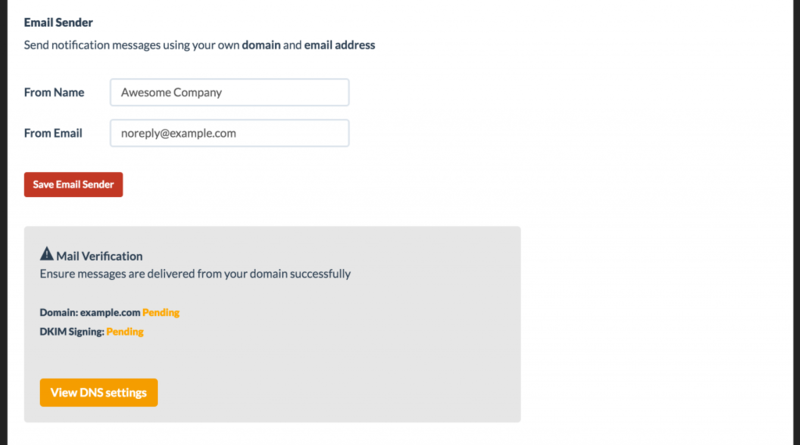 Deliver email notifications using your own domain and email address. Status.io relies on Amazon SES (Simple Email Service) for reliable delivery of status notifications. Amazon requires every domain to be verified before sending email messages. Verification is required for all custom domain names. To verify your domain name, log in to the Dashboard and select the Notifications tab. Enter your desired From Name and From Email, then click Save Email Sender. Next click View DNS Settings and copy the TXT record value listed below Domain Verification. Add the required TXT record to the DNS zone for your custom domain. Our system will continuously check for this DNS record to verify the domain. This process usually takes under 1 hour, but could take up to 72 hours. Note: Status notifications will be sent from noreply@status.io until your domain is verified. Your DNS provider does not allow underscores in TXT record names—You can omit the _amazonses from the TXT record name. You want to verify the same domain multiple times and you can’t have multiple TXT records with the same name— You might need to verify your domain more than once because you’re sending from multiple services. If your DNS provider does not allow you to have multiple TXT records with the same name, there are two workarounds. The first workaround, if your DNS provider allows it, is to assign multiple values to the TXT record. The other workaround is that if you only need to verify your domain twice, you can verify it once with _amazonses in the TXT record name and the other time you can omit _amazonses from the record name entirely. We recommend the previous solution as a best practice, however. Authenticated email proves that the messages are not forged and that you have given permission for Status.io to send email messages from your domain. This ensures that your messages are not rejected or flagged as spam. We use DKIM signing to authenticate messages. 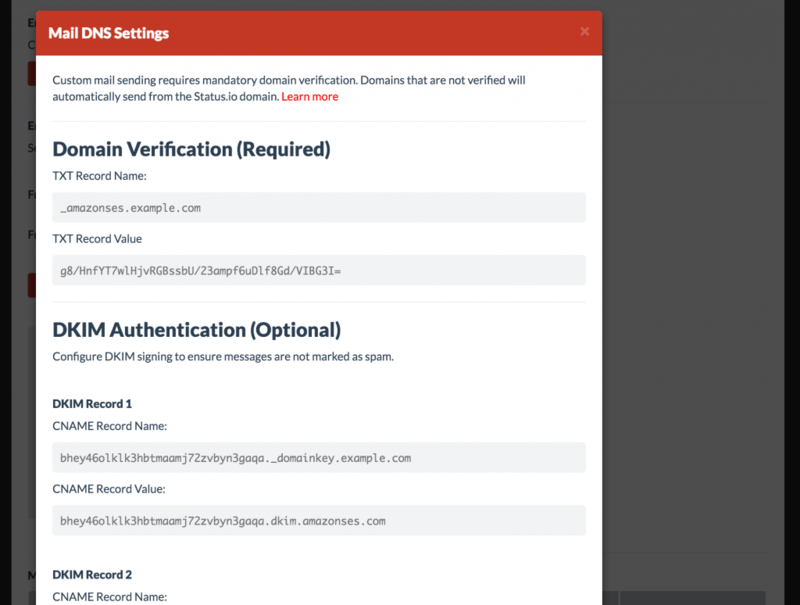 Configuring DKIM signing for your domain name is similar to domain verification. Log in to the Dashboard and select the Notifications tab. Next click View DNS Settings and copy the TXT record values listed for each of the DKIM records. Add the required TXT records to the DNS zone for your custom domain. All 3 records must be used. Our system will continuously check for this DNS record to verify DKIM signing. This process usually takes under 1 hour, but could take up to 72 hours. An SPF record indicates to ISPs the servers authorized to send email for your domain. This ensures that your messages are not rejected or flagged as spam. Log in to the Dashboard and select the Notifications tab. Next click View DNS Settings and copy the SPF record value listed below Sender Policy Framework. Include the SPF record in the DNS zone for your custom domain.